The sky is the limit when you book a scenic tour with Wings of the Ozarks. Proud to cater to your interests, the 30 minute aerial scenic tours designed for 1-3 people, can fly over what sights and areas YOU want to see. Anything from real estate to area attractions to just the beauty of the Ozarks can be seen in the airplane tours. Prices start at $89 for 1-3 people. Larger groups can be accommodated. Please call our office or visit our website for more information. Local Businessman Brings Helicopter Tours Back to Branson! Ozark Mountain Helicopters is proud to announce that visitors to Branson can once again experience the thrill and excitement of flying in a helicopter. Jim Evertsen, a contractor from West Plains, Mo, is taking his love of flying helicopters to new heights. With the absence of this exciting and anticipated attraction in Branson over the past two years, many rumors, online message boards and hopeful tourists kept the dream alive that someday, helicopter tours would return to Branson. 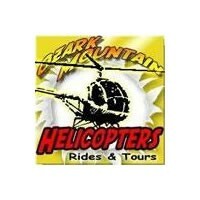 Well, Ozark Mountain Helicopters has seen the need and is answering the call. "We get calls every day from individuals who took a ride as a child, and can still remember the feeling and excitement of being up in a helicopter, and want to share that feeling with their children." "That's why I love what I do." Says Evertsen. This business is unique in the fact that it involves two father/son teams. Jim, who has been flying Helicopters religiously for the past six years will function as Owner and Chief Pilot, while his son Casey assumes the responsibilities of the Director of Marketing and Public Relations. The second father/son team consists of Lee and Shanon Christensen. With over 60 years of flight experience between the two, there is little these two have not seen or done in a helicopter. To maximize the safety of their passengers, the Taney County Airport has been chosen as their base of operations. With its close proximity to Hwy 65 and Branson Landing, it is lacking the tall hotels, overhead wires, traffic lights and nearby obstructions that are not conducive to safe take offs and landings. The tours will take passengers over Branson Landing,Hwy 76, Table Rock Dam, Lake Taneycomo, Inspiration Tower and Silver Dollar City. JOIN US THIS WEEK AS ROCK AND ROLL INDUCTEE BILL MEDLEY AND HIS DAUGHTER MCKENNA MEDLEY JOIN LOGAN AND RAY AT THE CABIN. LISTEN IN AS BILL DESCRIBES HIS LIFE IN MUSIC, ENTERTAINMENT AND BRANSON. MCKENNA DELIGHTS US WITH HER OWN TALES ABOUT HER DAD’S LIFE AND HER OWN SHOW BIZ CAREER. AS ALWAYS, WE FEATURE THE BEST IN MUSIC FROM BILL AND MCKENNA MEDLEY. TO LISTEN IN, CLICK ON WWW.BRANSONTONIGHT.NET AND MAKE SURE YOUR SPEAKERS ARE TURNED UP! DON’T FORGET TO CALL THE BRANSON TOURISM CENTER TO BOOK YOUR NEXT BRANSON VACATION! 1-800-785-1485 OR CHECK OUT THEIR WEBSITE AT WWW.BRANSONTOURISMCENTER.COM. THOUSAND HILLS IS THE BEST PLACE TO STAY AND PLAY IN BRANSON! TO TAKE A VIRTUAL TOUR OF THOUSAND HILLS GO TO WWW.THOUSANDHILLS.COM. CALL 1-877-262-0430 FOR MORE INFORMATION OR TO BOOK YOUR STAY TODAY. Saturday November 10th during Veterans Homecoming in Branson, Missouri. Maj Gen John Phillips, Former Deputy Under Secretary of Defense,Trish the Dish! and Steve Weyher of Golden Corral will host the “STARS & CELEBRITIES LUAU” Honoring the Tuskegee Airmen and all Veterans. For ticket information contact: Trish Mouat 417-777-4063 or 417-336-6350. Tickets for the event $40.00 per person. The Branson Veterans Task Force will hold its monthly City Wide Meeting Wednesday, July 25, 3:30 p.m. at the Citizens Union State Bank, Community Room, 4675 Gretna Rd. Over five days, 206 acts, 119 kids from 11 states, 72 volunteers and 22 judges will have participated in the 2007 American Kids National Finals during which $6,000 in cash prizes, $5,000 recording session, 28 trophies, over 500 medals and two college scholarships will be awarded. The event will culminate in the AllStar Show at 2 p.m. Friday, July 20, at the Baldknobbers Theatre where 25 of the top acts from the week-long competition will be showcased. One winner will be selected as Performer of the Year and win a $1,000 cash prize and a $5,000 recording session from Voice Recording Studio of Branson. Tickets to the show are $10 and available at the door. "Before American Idol, Star Search and America's Got Talent, American Kids Inc. has been showcasing the nation's talented young performers for 25 years," said Dr. Dale Smith, founder of the non-profit group dubbed America’s only “little league” of entertainers. "It all comes down to this Friday afternoon competition, but it started with local, regional and state competitions," said Brenda Hoffstatter, the non-profit group’s national director of competitions. "We appreciate our judges who will be selecting the Performer of the Year as well as those who have judged throughout the week. Judges are a vital part of this competition and without their expertise, our kids would not be able to learn and grow in their talents." AllStar judges are Ben Brooks of Ben Brooks Marketing who has helped break hits songs for numerous Norah Jones, Creed, Ray Charles, Kelly Clarkson and Carrie Underwood. Cheryl Broz, an executive marketing professional, markets and promotes Christian artists to the mainstream. She has worked with Arista Records, EMI Christian Music Group, CMG Global Marketing and Columbia Records among others. Chris Korblein from Los Angeles, guitarist, writer and producer has performed across the country and around the world. The first single on his third CD shot to the top of national radio's most added list and remained there for several weeks. David Sandy is an entertainer and an award-winning show producer responsible for five popular shows in Branson, The Haygoods, Red Skelton, A Tribute by Tom Mullica, Tony Roi's Elvis Experience, Red, Hot & Blue! and Siegfried and Roy present Darren Romeo, The Voice of Magic. Celebrating its 25th anniversary, American Kids is different from other competitions in the performance opportunities given the group’s membership outside of the competition. The organization is open to all youth from ages 3 through high school seniors, alumni, their parents and supporters. “Our members, with guidance from our certified adult volunteers, present a vast number of shows on the local, regional and national level to share their talent gifts for the benefit of others,” said Hoffstatter. Numerous college scholarships have been awarded over the past two and a half decades. The two college scholarships that will be awarded during national competition are the $1,000 Taco Mayo Scholarship and the $1,000 Carolyn Snow Memorial Scholarship. Snow, the late wife of Dr. Dale Smith, served as the organization's executive director. For more information about the 25-year-old program, American Kids Inc., call 1-800-377-8117 or go to the website at americankids.com. Hosted by the Ar-Can-Sas, Progress, KC’s Best, and Gateway chapters of the Brewery Collectibles Club of America. Branson, MO — He is, by any standards, one of the most influential stars in America today. Whether it be through concert appearances or recordings, television or films, commercials or education, Bill Cosby has the ability to touch people’s lives. His humor often centers on the basic cornerstones of our existence, seeking to provide an insight into our roles as parents, children, family members, and men and women. Without resorting to gimmickry or lowbrow humor, Bill Cosby’s comedy has a point of reference and respect for the trappings and traditions of the great American humorists. THE MANSION ENTERTAINMENT AND MEDIA CENTER is pleased to announce the performance of well-known comedian and five-time Grammy Winner Bill Cosby, October 13 in Branson. For more than five decades he has graced us through virtually every entertainment outlet. Cosby’s initial immediate success began with Bill Cosby Is A Very Funny Fellow, Right? and continued with many other comedy albums. He also has released a number of jazz recordings, including hello, friend: to ennis with love (released in 1997). "THE MANSION continues to search and acquire major stars for our customers to enjoy — we are pledged to that goal and the public has told us by ticket sales that we are succeeding." Says Larry Wilhite. Currently, Celebrate AMERICA and The Promise are performed daily at The Mansion and a third show, Country Tonite, will soon be joining the production list. For more information on daily shows at THE MANSION, or to book tickets for Bill Cosby or other big name artists appearing in 2007, log on to our Web site, www.TheMansionTheatre.com. their way into your heart. Immediate Release–Branson, Missouri is one of the many locations that a production crew from California will film for an IMAX Documentary. Wednesday morning July 11 at 10:30am, the film crew will be behind the Grand Palace Theatre to film the American Highrise Monument, the image that has fast become the most widely viewed ‘American Themed art in history’. The American Highrise is a quarter of an acre in size and was unveiled on September 11, 2002 to mark the first anniversary of 9/11. “The documentary will be released in September 2008 and will feature our National monuments and iconic America in an IMAX format as well as true stories of personal triumph and the opportunities that our great country provides. It is a groundbreaking approach to illustrate what truly binds us as a nation.”–Ron Clark, Production Coordinator. “Proud American” an ambitious documentary has been in production since January of this year. Film locations include Colorado, Philadelphia, New York, Washington D.C., Massachusetts, Kansas, Missouri, California, and Hawaii. While in Branson, the film production will also feature Famous Russian Comedian Yakov Smirnoff along with Presidential Inaugural Artist Richard Daniel Clark. Film Credits include: Fred Ashman–Director, Mark Eberle–Director of Photography, Aili Kato–Producer, Laura Routsong–Associate Producer, and Ron Clark–Production Coordinator. Please see www.proudamericanfilm.com for more information.